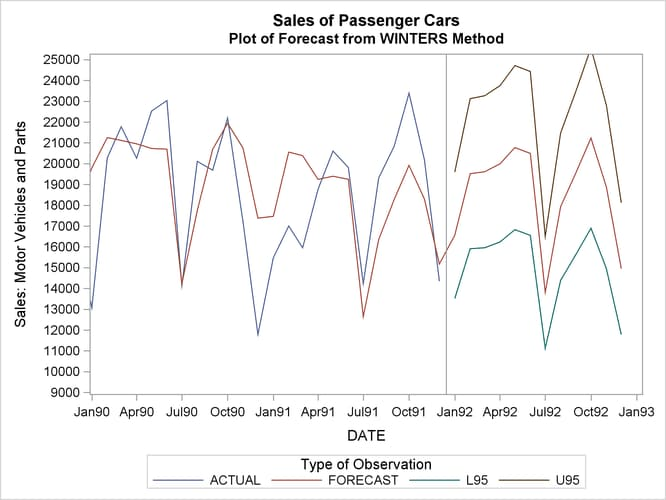 This example uses the Winters method to forecast the monthly U. S. sales of passenger cars series (VEHICLES) from the data set SASHELP.USECON. These data are taken from Business Statistics, published by the U. S. Bureau of Economic Analysis. The following statements plot the series. The plot is shown in Output 16.1.1. The INTERVAL=MONTH option indicates that the data are monthly, and the ID DATE statement gives the dating variable. The METHOD=WINTERS specifies the Winters smoothing method. The LEAD=12 option forecasts 12 months ahead. The OUT=OUT option specifies the output data set, while the OUTFULL and OUTRESID options include in the OUT= data set the predicted and residual values for the historical period and the confidence limits for the forecast period. 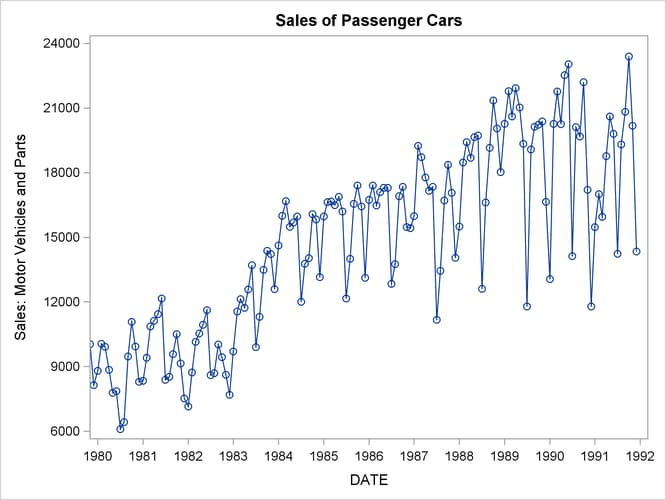 The OUTEST= option stores various statistics in an output data set. 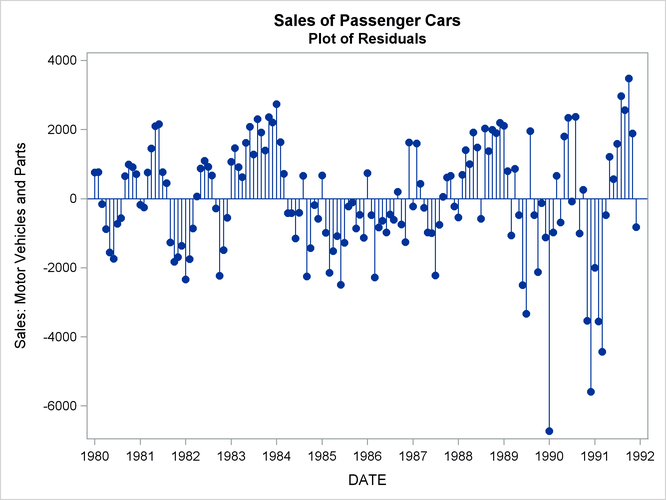 The WHERE statement is used to include only data from 1980 on. The listing of the output data set produced by PROC PRINT is shown in part in Output 16.1.2. The PROC PRINT listing of the OUTEST= data set is shown in Output 16.1.3. The following statements plot the residuals. The plot is shown in Output 16.1.4. The following statements plot the forecast and confidence limits. The last two years of historical data are included in the plot to provide context for the forecast plot. A reference line is drawn at the start of the forecast period. The plot is shown in Output 16.1.5.